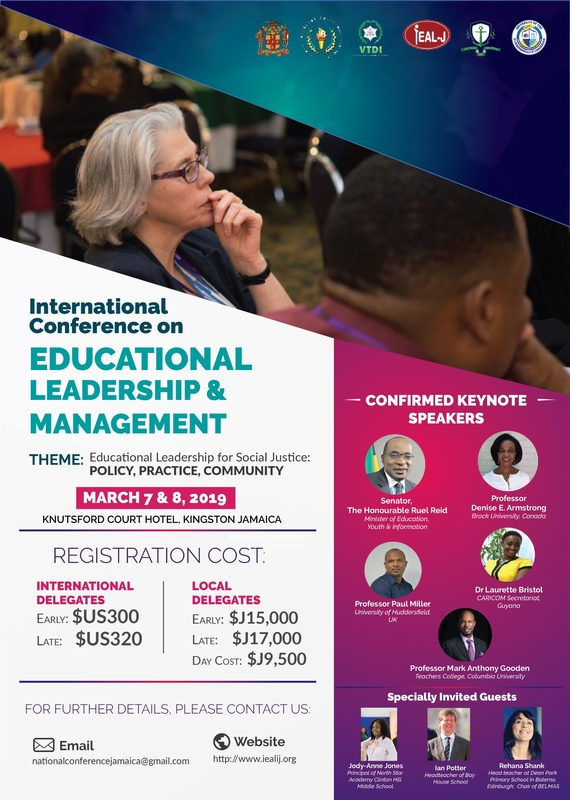 The Institute for Educational Administration & Leadership, Jamaica (IEAL-J), Ministry of Education, Youth & Information (MoEY&I), Catholic College of Mandeville (CCM), University of the Commonwealth Caribbean (UCC), Vocational Training Development Institute (VTDI), National College for Educational Leadership (NCEL), invite abstract submissions for the Third International Conference on Educational Leadership & Management to be held March 07 – 08, 2019 at the Knutsford Court Hotel, Kingston, Jamaica. We are inviting submissions from teachers, principals, research students, researchers, policymakers, teacher educators and anyone interested in educational administration, management and leadership in all types of schools (public and private) and at all levels of an education system (early childhood, primary, secondary, further and higher education). Presenters may address other issues and topics associated with educational administration, management and leadership that reflect local, national and/or international perspectives and contexts that draw on practical, professional, research, policy, or other experience or expertise. Presenters may tailor their proposal submissions to the types of sessions listed below. These sessions will typically include between two or three papers presented in a 60 or 90 minutes session. Papers should normally be based on recently completed or ongoing research related to educational administration, management and leadership. A chair will be appointed for each session, who will manage timings and facilitate discussion. The purpose of these sessions is to provide a space where a significant time (usually 60 minutes) can be spent on examining a particular topic. The chair for this session will usually be one of the presenters. The purpose of this session is to provide a space where teachers and school leaders can, together, reflect upon and consider a range of issues related to their practice. Papers presented in this sessions are carefully chosen to stimulate debate and/or advance solutions for education practitioners.  Relevance to the conference theme: Linking topic to the conference theme and to the field of educational leadership, management & administration.  Final date to receive abstracts: 31 August 2018. Extended to 12th October 2018.  Late registration begins: 01 January 2019 – 07 & 08 March 2019. A Special Issue of the journal, Research in Educational Administration & Leadership (REAL) will be published as conference output (possibly in December 2019). ALL papers included in the Special Issue will be double-blind peer reviewed. Please submit abstracts to: nationalconferencejamaica@gmail.com. You may also visit http://www.iealj.org/ for further details.